Robin Gard leaves the Board after 7 years. I became involved in our communities’ libraries during our campaign to become a Library District in 2006, and was privileged to be named to the founding Board of Trustees in 2007. This year, after seven years of service on our Board, my term is coming to an end. I am so proud of all that we have accomplished since then. It has been a great pleasure to work with library leadership and staff, and our partners, the Friends of the Library and the Library Trust, to help our libraries thrive. What could be more fun than being part of a team to realize the dreams we all have for our libraries? 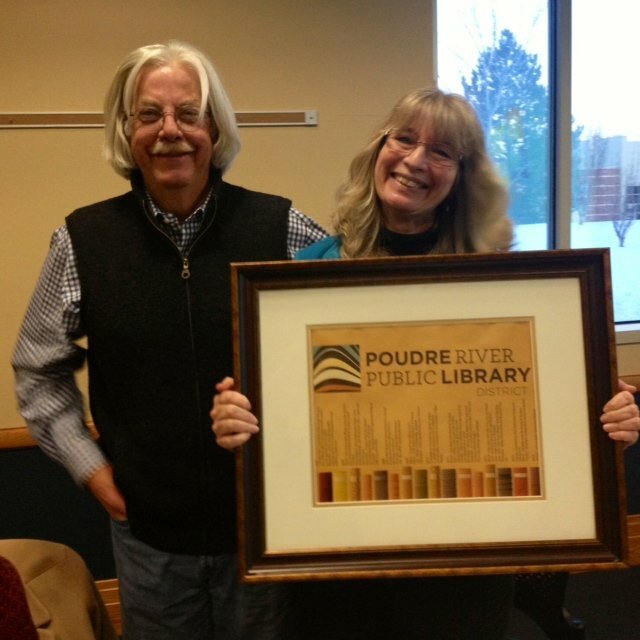 Robin receives a going away gift from Mike Liggett and the Board of Trustees. Our community and its support make it possible for us to continue to serve our patrons in innovative and collaborative ways and I am optimistic and confident about the future.